Includes 383-page kit (may be downloaded as a pdf or ordered as a hard copy) with teacher guides for all eight units, including all activities, readings, slide shows, film clips, journal articles, advertisements, and more. Lessons teach core knowledge about the science of climate change, explore conflicting views, and integrate critical thinking skills. 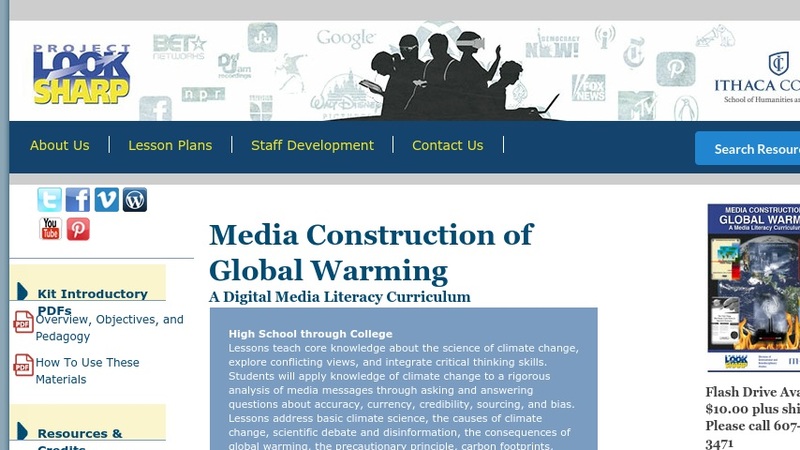 Students will apply knowledge of climate change to a rigorous analysis of media messages through asking and answering questions about accuracy, currency, credibility, sourcing, and bias. Lessons address basic climate science, the causes of climate change, scientific debate and disinformation, the consequences of global warming, the precautionary principle, carbon footprints, moral choices, and the history of global warming in media, science, and politics.